Some important articles are going around the climate change twitter and social media spheres (yes, that’s a thing). The discussion focuses on the Green New Deal (GND), its theory of change, and its chances of ever becoming a reality. We need these debates. My reaction here is mainly to Taylor’s longer article which challenges GND proponents about what’s possible to get passed in the U.S. Congress. It questions their swing-for-the-fences approach versus a more realistic approach (It would oversimplify to characterize Taylor as pushing for “incrementalism” per se, but that’s, in essence, the other “side”). There’s a larger, longer question about whether the GND does in fact overreach, which Taylor and Roberts (in some other articles) cover really well. So let’s just stipulate that (a) the GND is undoubtedly a kitchen-sink list for progressive goals and (b) the creators are aware of that and clearly believe that a real climate movement requires a broader left-driven coalition. The scientific question: How big a mobilization do we need, and how fast, to cut emissions enough to avoid disaster? The related economic question: What’s the level of investment required to actually move the needle? The political question: What’s the best path to passing something of substance given the political realities in the U.S.? This is an area where I have some disagreement with Taylor. He quotes reasonable-sounding estimates on the cost of reaching the “mid-century timetable” — i.e., an 80% reduction in emissions by 2050 — of about $200 to $400 billion per year. The point, he says, is that GND supporters shouldn’t overstate the scale of economic transition needed (and thus scare off some moderate skeptics and fiscal conservatives). My concern is not really whether the costs seem modest. In fact, that 30-year goal allows a LOT of time for cleaner techs to continue getting cheaper, thus making the 2050 goal easier. No, I’m more concerned that this mid-century timeline is now out-of-date and doesn’t take the risk-aversion approach we need, and thus a much faster mobilization is needed. The latest news on climate science is, to get technical, not good. Climate impacts are happening faster than scientists thought. The October bombshell from the Intergovernmental Panel on Climate Change, the IPCC 1.5-degree report, tells us we need to cut emissions in half by 2030 (and then rapidly go down from there). I’ve talked to one of the lead authors and the story is actually worse. At just 2 degrees warming, we lock in many dire outcomes such as the complete loss of coral, vast damage to other major ecosystems, greatly increased extreme weather, and the permanent flooding and loss of cities like Miami and most of low-lying nations like Bangladesh. We have very little time to slow the pace of change in our planetary thermostat. And many policy goals around the world and in U.S. cities and states are already shifting to reflect this reality. California committed to net zero total emissions by 2045 and many large states are proposing and enacting goals of 100% renewable energy by 2050. But all that aside, what if we take a risk management perspective? After all, the risk we’re talking about is an uninhabitable planet. It’s worth noting that for any given warming target (say 1.5 or 2 degrees), the IPCC’s estimates of our global carbon budget — that is, how much we can still burn and stay within the target — give us just a two-thirds chance of getting there. Meaning, even with dramatic reductions in carbon, we have a 1/3 chance of blowing by the target. Thus, and obviously, if we want higher odds of avoiding planetary catastrophe — which I’d really like — we must be much more aggressive in re-tooling the carbon economy, not less. With that in mind, a large-scale “war-footing” mobilization, which Taylor criticizes as an overblown message from the GNDers, is increasingly looking like the conservative and prudent choice. If we want higher odds of avoiding planetary catastrophe, we have to be much more aggressive in re-tooling the carbon economy, not less. So on to the related economic question. Let’s agree that there are (a) plenty of climate mitigation efforts with a great short-term ROI for business and families, like renewables and efficiency but, (b) the faster pace of change needed now could mean serious investments in new infrastructure and tech, as well as real loss in parts of the economy that are disappearing, such as fossil fuels (which, to be fair, is part of the reason the GND writers included job guarantees). My concern is the framing here, which still makes the economic discussion almost entirely about the cost of action — or the perceived cost of action which would influence the political viability of solutions. In these discussions we don’t seem to be fully acknowledging the staggeringly high costs of inaction — not just billions or trillions of economic value, but, again, undermining the basis of our economy and life itself. In my work with the private sector, I see this same bias. We’re mired in the question of “How much will this cost?” instead of fully valuing the risk reduction of avoiding extreme climate change…or fully measuring the benefits of possible innovation, new revenues, and intangible value creation from building a pro-climate business and brand. I see some movement on this lately, but it always seems that in the political realm, it’s all about the perceived cost. And that brings us to the main question of political realism, which Taylor knows as well as anyone. Taylor lays out what he assumes (I’m sure correctly) is the theory of change underlying the GND — that the only way to pass something like this is with a sea change in political power toward progressives, who would need to control the House, the Senate, and the Presidency. Taylor makes a compelling and damning argument against this general “steamroller” theory. He points out some flaws in the whole approach, including evidence that the public tends to move in opposition to the president, getting more liberal under right-leaning presidents, and vice versa. I should say that this whole article is done with mostly respect for the GND proponents (although using words like “zealots” is not helpful), but the core framing is that to succeed, a solution must be bipartisan. And thus, Taylor says, GND proponents should worry about turning off the right by appearing like a “watermelon,” as in “green on the outside and red on the inside” [i.e., Commie]. But this assumption that we need bipartisanship to pass anything is where I have questions (and guess that Roberts from Vox does also). As I see it, we have a very big problem in the U.S. which I feel this article doesn’t truly internalize: at the federal level, being against climate action has become core to the GOP party identity, along with pro-life, gun rights, and a few other immutable positions. For 30 years, the fossil fuel industry has helped shift the conversion from what is a scientific question — i.e., is the planet warming dangerously and what can humans do about it? — into a purely political one (see the incredibly good podcast Drilled on this history). We seem to be in a place, for years now, where it’s a political loser for a GOP Senator or Representative to give climate change anything more than lip service. I’ve heard reports of a secret cabal of GOP senators and congressmen who do want climate action. That’s nice, but so far, their secret is very safe from the rest of us and is not reflected in any votes, ever. At the federal level, being against climate action has become core to the GOP party identity. Dave Roberts at Vox covers all of this territory extremely well, showing how extreme the voices on the right have become on this topic. Lately, they’re scaring their supporters with tales of bans on cows and how your house will lose power when all that unreliable wind stops blowing. So if you internalize the 30 years of hostility from the right, you reach different conclusions. What the GND proponents are recognizing, I think, is that time has run out to wait for a mythical policy football that the GOP’s Lucy will actually let the Dem’s Charlie Brown kick. So back to the GND. Given the level of intransigence from the GOP, the “steamroller” strategy of creating a broad movement and taking all levers of power, however unlikely, seems like the only option. Who could blame GND-ers for not waiting for a GOP conversion miracle? We have to keep working toward a solution. In my world, I and my peers will continue convincing business that climate action represents trillions in business opportunity and risk avoidance, and is also required by physics and morality. I’ll encourage the business community to get off the sidelines and push for political action as well. Then, maybe, some moderate GOP votes could swing. In parallel, I’d respectfully ask that those with influence on the policy right — and Taylor and the Niskanen Center have credibility — continue to push GOP reps to shift their thinking and votes. I do understand the concern about the GND “turning off conservatives,” but let’s be honest: Will today’s GOP ever listen to AOC or other GND proponents no matter how nicely they couch the policy? No, the climate phone call has to come from within the proverbial conservative house. But here’s what’s really scary to me: Roberts and Taylor are both right. We need a Hail Mary and its odds of success are low. Passing the GND is not “realistic” and counting on bipartisanship is wishful thinking. None of this leaves us in a great place. But at least we’re having a debate about how big to go on climate action instead of whether we should act at all. 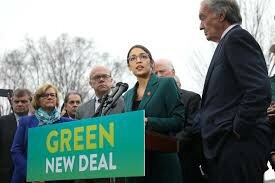 So in some sense, the Green New Deal has already achieved a small, but important victory.